Waist high professional grade tubs - easy on your back and knees. Leave the mess to us - you don’t need to worry about getting your floor soaked or full of wet fur. We provide all the supplies - brushes, combs, nail clippers, scissors, and an apron to keep you dry. Professional high-speed dryers - allow for quick drying. We also have plenty of towels and shammies on hand. We provide high quality, mild, effective products - we exclusively carry earthbath shampoos, eye & ear wipes, & fragrant spritzes. They don’t contain parabens, harsh soaps, artificial dyes, fragrances, phosphates, or toxins. We have special shampoos for smelly dogs, itchy dogs, sensitive skin dogs, or for owners who just want their dog to smell great. What are the key benefits to bathing your dog regularly? Grooming and handling is one of the best ways to strengthen your relationship with your dog. Handling your dog often will increase their confidence, allowing them to better handle stressful similar situations (e.g. vet office visits, groomer visits). Wash away dirt and allergens that may irritate your dog’s skin and make them itch. Helps to remove dander that accumulates on your dog’s fur. This may reduce any friend or family member’s allergic reaction to your dog. Get rid of dirt and anything else that you don’t want on your furniture or rugs. Dogs can get into and roll around in some interesting things. We wanted our pricing to be as simple as possible. One price for every dog. It's the same for small dogs, big dogs, heavy dogs, short hair dogs, and long hair dogs. You get 30 minutes in a tub with access to all of our supplies. Have two dogs? Wash them back to back in the same tub for one price. If you are doing more than a straight wash, you can purchase more time. We have a special Suds Club program for frequent pet bath users. There is no cost to join. Just ask for a membership card the next time you bring your dog in to get a wash. Your card gets punched with each wash and your 10th wash is FREE. YOU Wash YOU Wash - we provide the supplies, you do the work! We want your dog to have a positive experience. If your dog is really fearful of baths, we recommend taking it slow. 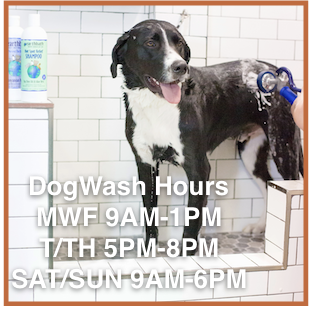 You could stop by our shop a few times before ever having your dog get in the bath. Each experience to our shop should be a good one. You might want to have your dog get in a bath without turning on the water. When the dog is comfortable, you can slowly introduce the water and the dryer. All with the goal of taking it slow and making sure your dog is not overwhelmed or stressed. Pair this with nice calm massages and lots of treats for an overall positive experience. We will help you each step of the way by doing our best to make your dog is comfortable with treats, peanut butter bath lick, or using products such as water free shampoo or alternatives to the spray nozzle and/or dryer. No. Just come on by. We have 5 tubs so the wait is usually very short, if any. If you are going to use one tub, either bathing the dogs at the same time or one after the other, the price is still $25 for 30 minutes use of the tub. If you need additional time, its $7 for another 15 minutes. We have one tub that has a gate so one dog can be in the tub and the other waiting their turn. We have curtains that can block the view of other dogs. You know your dog best and while bathing, you are responsible for keeping your dog under control. You can also call ahead to see how busy we are or wait for an opportunity when the store is empty to come in. Yes. We clean and disinfect them after each bath with a cleanser used at many veterinary hospitals and boarding facilities. Everyone is automatically enrolled in our Suds Club Program. We’ll punch your card every visit and your 10th bath is free. Plus, your dog gets their picture on our Suds Club Wall of Fame. Our office is closed on holidays. Click here to see our full holiday schedule.